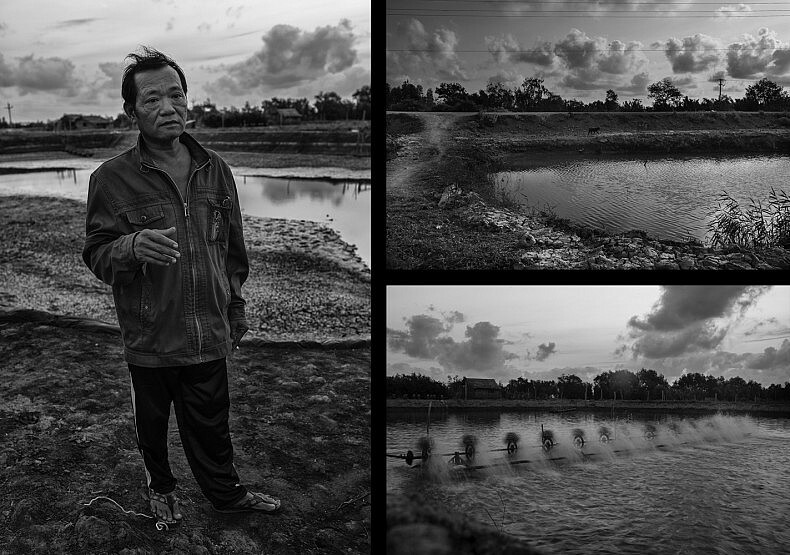 On the island of Phu Thanh, shrimp farmers face serious environmental challenges. “Wrong way!” Stephen, our driver, shouted at Pablo through the rolled-up window of his 4×4. We had jumped out of the car to take a ferry across the Mekong to the toothbrush-shaped island of Phu Thanh, and apparently Stephen was unimpressed with our door-closing technique. Heedless of the swarms of motorcycles flowing around the vehicle, he engaged the handbrake and got out himself to demonstrate the proper method. Satisfied with his tutorial, Stephen re-entered the vehicle and released the brake to roll down the steep concrete pitch leading to the ferry. Within ten minutes, the ferry captain maneuvered his vessel away from the shore and aimed it at Phu Thanh, which lay on the other side of the river, a little less than a kilometer away. Lottery ticket vendors mobbed us immediately, thrusting fistfuls of shiny cards at us and excitedly pointed out auspicious numbers they deemed might be of interest. When it became clear that we weren’t likely to play, most shuffled away, mumbling bitterly. A persistent few hovered at the periphery of our group, staring with a mixture of curiosity and entrepreneurial ambition. In a nation where gambling has been illegal since the 1970s, the Vietnamese appetite for the state lottery seemed insatiable. I counted no less than five ticket sellers compared to only one car — ours. 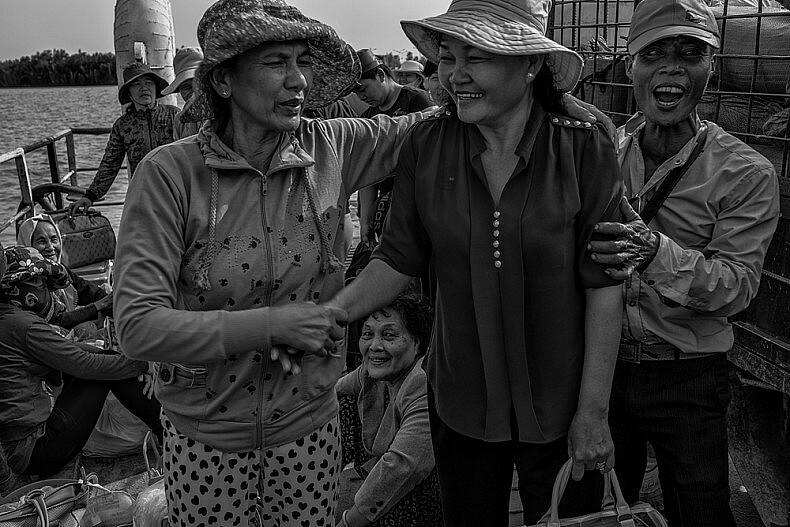 Passengers delight in having their photograph taken on board the ferry from mainland Den Do to the small island of Phu Thanh in southern Vietnam. Ferries are used as transport throughout the Mekong Delta Region, a maze of small canals, rivers and arroyos interspersed with villages and floating markets. Photo by Gareth Bright. Phu Thanh’s narrow and often uneven roads were not meant for cars. Our Toyota (the only four-wheeled vehicle we would see on the island in two days) bounced angrily and unpredictably as we navigated through the island’s interior towards its southern edge. At one point our translator, Mi, issued a burst of what I can only guess were profanities from the back seat when her head was smashed unceremoniously into the roof by an invisible depression in the asphalt. Stephen glanced briefly into the rear view mirror, but seemed mostly unconcerned. He was from Can Tho, one of southern Vietnam’s major cities, while Mi was from the Hanoi, far to the north. Though the two got along extremely well, a definite rivalry was apparent between the northern and southern cultures, and I thought I caught a small glimmer of satisfaction in his reflected eyes. Later in the trip, after what would be hands-down the roughest and most trying day, Stephen would remark victoriously that the highlight of our entire journey was seeing a northern girl cry. Despite the rough ride, we were all well aware that having a personal vehicle was a luxury. We knew that while Vietnam’s relatively developed infrastructure and road network made it more practical to travel by car than by boat, the farther we got into our trip the rougher the travel would be. Bouncing around in Stephen’s car that morning, had we known just how exhausting things would get in the coming months, we would have savored every moment. 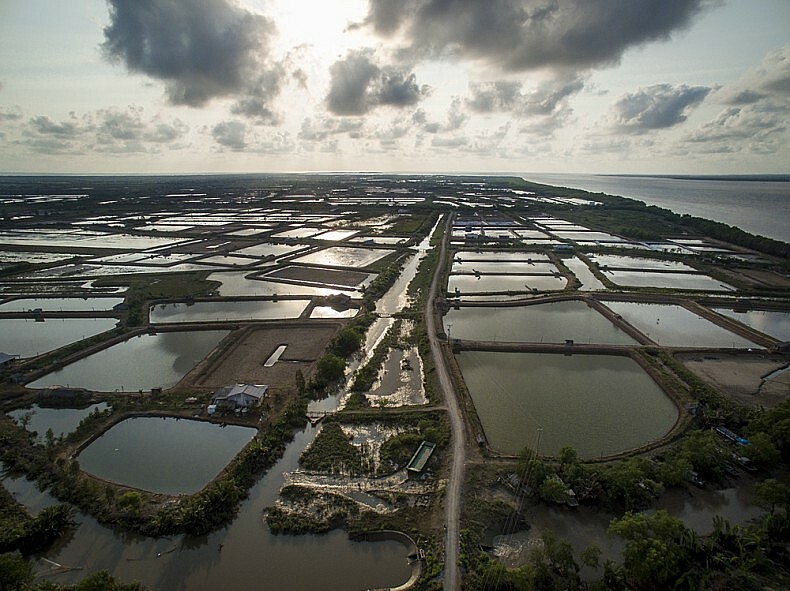 Aerial views of the shrimp farms on the island of Phu Thanh in Southern, Vietnam. Photo: Luc Forsyth and Gareth Bright, via drone. We had been told earlier by Ngyuen Than, a shrimp boat captain, that this area of the Mekong no longer supported a wild fish population large enough to sustain the people plying its waters, necessitating the construction of inland farms for people too far from the ocean. It was these farms we were searching for on Phu Thanh. After an hour of driving we had seen many such farms, comprised of a series of wide ponds with earthen banks; all seemed devoid of activity. 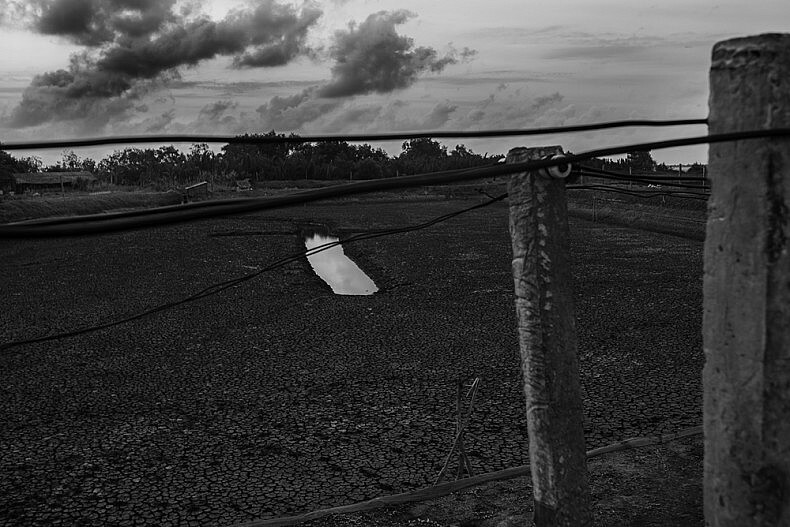 Roughly one in five ponds was drained completely, their mud bottoms cracked and hardened by the tropical sun. 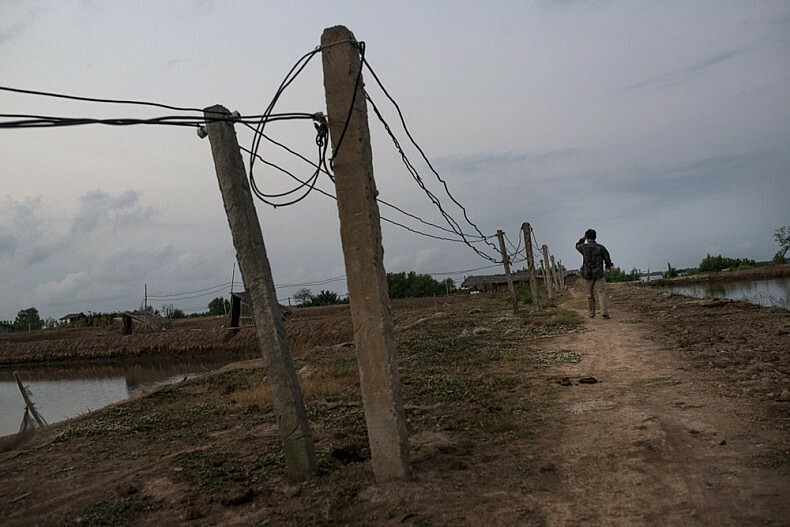 Long axles lined with fan blades spun hypnotically in those ponds still containing water, but the people (the most essential component for documentary storytelling) were elusively absent. As the sun dropped closer to the horizon we feared we would lose the ideal golden light for photography, so we decided to stop at the closest farm, empty as it looked, to try and make the best of the situation. No sooner had we done so when a lone motorcycle approached and turned into the farm. Tan Van Vu (whose name we decided to change for his protection after learning Phu Thanh was a military-controlled island, with media subjected to heavy scrutiny), was a 51-year-old whose friendliness was evident from the first time he waved us toward his house. He seemed eager to speak with us, and quickly poured out cups of cooled tea as we sat down around a wooden table behind his house. Unlike the ocean-going fishermen we had spoken to a few days earlier, we learned that away from the coast as we were, the river played a far more important role in people’s lives. 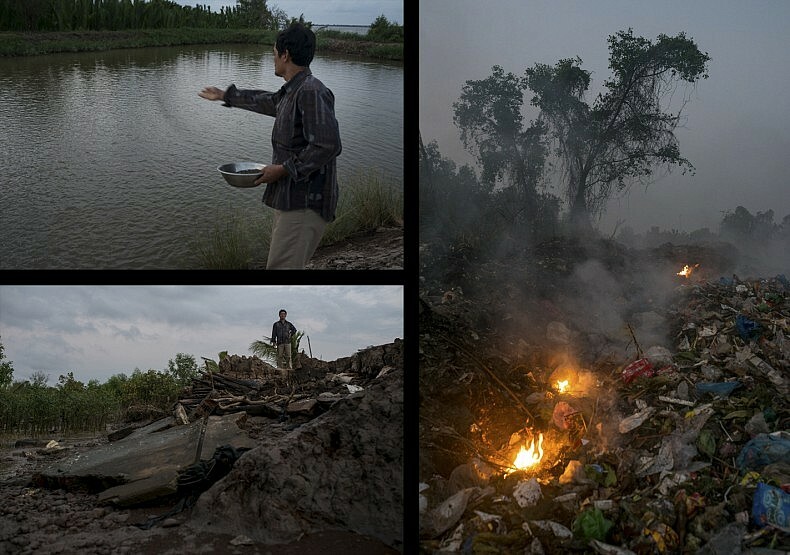 “We live on the banks of this river, and we care a lot about its health,” Vu told us. Shrimp farmer Nguyen Van Boi throws food into one of his shrimp ponds (TL), and stands by the eroded banks alongside his shrimp farm (BL). The local rubbish dump smolders near the shrimp farms on the island of Phu Thanh in Southern Vietnam (R). Photos by Luc Forsyth. According to him, the Mekong’s health was not good. Checking the level of our tea cups and pouring more when necessary, Vu went on to explain the series of misfortunes that had drastically impacted Phu Thanh’s shrimp farmers. The dual forces of erosion and pollution, he said, had dropped his farm’s productivity by 40 percent since 2011 — surely an unsustainable rate of decline. Tan Van Vu points towards the coastal erosion, which in combination with an increase in river-borne pollutants has led to a 40 percent decrease in his farm’s productivity. Photo by Gareth Bright. Leaving the shady comfort of his outdoor sitting area, Vu, joined by his neighbor Nguyen Van Boi, took us on a tour of his property to show us what he had been talking about. At the southern extremity of his farm, the part closest to the river, we immediately saw what he meant about erosion. A scant five meters separated his shrimp ponds from the river, and judging by the crumbling banks it looked like that buffer was lessening by the day. 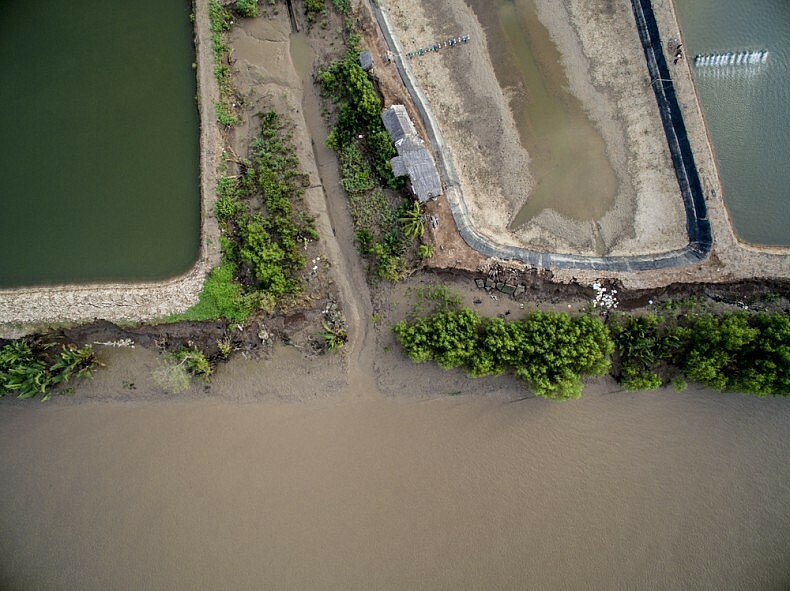 “In 2009 a storm destroyed the mangroves [on the river bank] and now nothing holds the land,” Vu said, as he surveyed the damage. 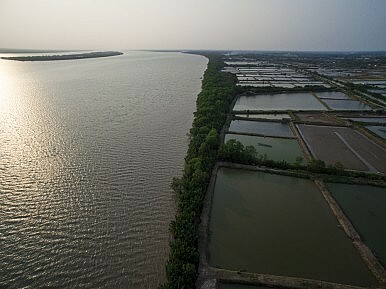 Aerial views of the shrimp farms on the island of Phu Thanh in southern Vietnam. Photo: Luc Forsyth and Gareth Bright, via drone. The upriver encroachment of the sea, while necessary to provide the salty water he needs to pump into his shrimp ponds, had in recent years increased to unprecedented levels. Vu went on to tell us that the current of the river was not nearly as strong as it had been in the past — which from our research into the state of the Mekong we could almost certainly attribute to the multitude of hydropower dams upriver. The weakened river flow, combined with the rising sea levels caused by global climate change, meant that the ocean was overpowering the river and inching deeper inland — devouring the farmers’ land as it did so. Not the type of man to sit passively as his livelihood was washed out to sea, Vu spent thousands of borrowed dollars driving cement pillars into the river bank in an attempt to artificially recreate the decimated mangrove root systems. It didn’t work. A dry shrimp pond. Photo by Gareth Bright. Ultimately he decided to hire day laborers to plant new mangroves, a process he knows will be effective against erosion in the long run, but as the trees need more than ten years to mature, it was likely too little, too late. A less clear cut problem, Vu told us, was water pollution. Lacking scientific testing kits to accurately identify specific pollutants, he can do little but guess what invisible chemicals were assaulting his farm. “In recent years the shrimp have been sick,” he said. After closing more than 10 of his ponds in less than five years — nearly half of his total — his situation was becoming desperate. “Farmers here need help and capital so we can check the pollution levels. Now, now, now,” he added, stressing the urgency. 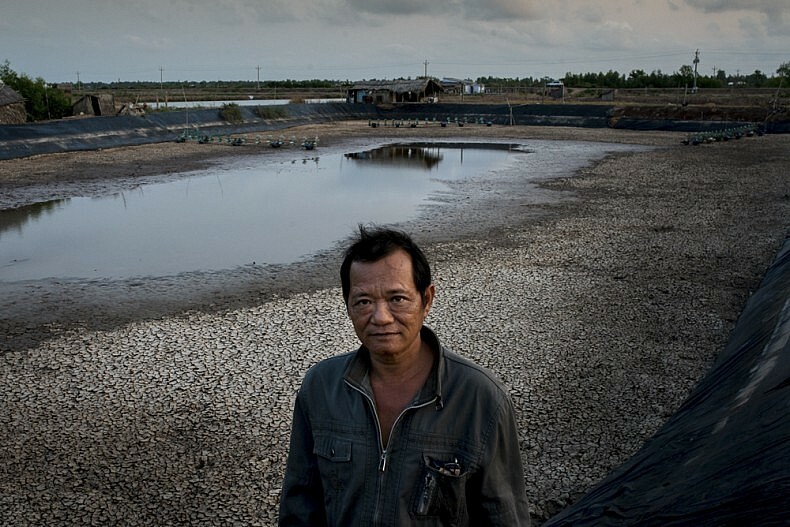 Shrimp farmer Tan Van Vu stands in front one of his drained ponds. Photo by Luc Forsyth. As is the case with all ecosystems, whether natural or man-made, problems in one link of the chain are not self contained. The unidentified poisons afflicting Vu’s shrimp are being ingested by all farms in the area as they pump water both in and out of the Mekong. If his farm’s eroded banks burst completely, spilling 250-300,000 sick shrimp into the river, the results would be catastrophic for downstream neighbors who would unavoidably draw tens of thousands of infected crustaceans into their own ponds. After a final round of tea and small talk, we left Vu’s home. Over dinner that night we reflected on the impossible unfairness of his situation. The river, the primary source of livelihood for farmers like Vu, was steadily becoming a destroyer instead of a life-giver. Later in our journey, as we moved deeper into the heart of the Mekong delta, we would see firsthand just how many pollutants were floating downstream towards Phu Thanh’s farmers, but at that moment we were still blissfully ignorant. The next morning, closing the doors gently to avoid Stephen’s ire, we bundled back into the car and set out for My Tho to get our first glimpse of urban life along the river. Shrimp farmer Nguyen Van Boi walks the perimeter of his shrimp farm on the island of Phu Thanh. Photo by Luc Forsyth. This piece originally appeared at A River’s Tail. As we make our way to the Cambodian border, we search for fishermen who make their living from the river.